I feel terrible canceling my visit to Denver for The Everyday Show, and embarrassed to have been the one coming down the mountain in the sled gurney with Mammoth Mountain Ski Patrol. What a wreck I was. It was the morning after Thanksgiving. The day started early. It was still snowing albeit ever so lightly and it was beautiful outside. There are certain ski runs that always try to defeat us. It’s a mental thing. But every run that day felt better than the run before. I had already completed a few steep runs including my favorite little black diamond run, called Patrolman’s. I am not a speed demon. I am not an adrenaline junky. I am a strong intermediate skier well aware of my abilities and weaknesses. Never do I get in over my head, or ski down a run beyond my skill set and confidence level. That’s just not me, not my style. I have progressed slowly and steadily over the last 8 ski seasons which is when I first started learning to ski. My husband had just said to me over breakfast that morning, and at Thanksgiving dinner the night before, “Honey, you are 10 good ski days away from going off the top of the mountain (AKA double black diamond runs).” This was a huge compliment considering my goal all along has been to ski fun runs where I can cruise around enjoying myself in nature, and not where I feel petrified like I am one turn away from heading down the mountain out of control like a big snowball. But still, it is just you and the mountain. No one can help keep you warm, or comfortable, or safe. You are responsible for your own gear. You are responsible for your turns, one after the other down the hill. No one else can get you down that hill except for you. It is a fun and beautiful way to escape the concrete bustle of the city and hang out with pine trees so frozen and fleeced with snow; it makes one wonder how they are strong enough to still be big and green and alive and gorgeously lush come spring once the snow melts. We were at the bottom of a blue run, and mind you I had already overcome my most favorite black diamond run earlier that morning, I took a funny turn in flat light through some powder. I was not going very fast; lost control of my right ski, which ended up behind me almost hitting me in the back of the head. I twisted around then felt a pull in my knee, went flying half way across the ski run, and landed in a mess of “please help me, my knee, ouch boohoo” crying face down in the snow. A young lady by the name of Alisa (total stranger and thank you) stopped and stayed with me until my husband could hike the 100 yards back up the hill. He was watching my amazingly beautiful turns from below until I wiped out. Mammoth App: The new Mammoth App is quite amazing. It has a tracker, which tells you what runs you’ve skied, vertical feet, miles, number of runs, and speed. It also has several other features. Thankfully I was able to use the app to call ski patrol for help. Getting in the sled gurney was terrifying. I have seen countless people taken down the hill in those things thinking to myself “I never want to be that person.” But today I was that person. Being claustrophobic didn’t help much either when they wrapped my leg into a box splint and then wrapped me up into the gurney like a little burrito or sausage. The ride down the hill was scary so I just kept my eyes closed. Mammoth Mountain Ski Patrol was shocked to find that I wanted out of my ski boot immediately. “The sooner the better” I kept saying, like it was my new mantra. It is surprising I remember all this so clearly because I was in excruciating pain and it seemed to have all happened in one big blur. My body went into shock. 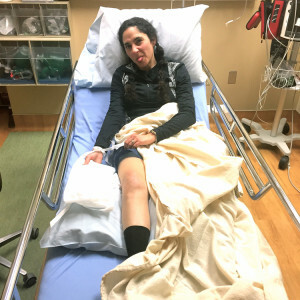 According to my mountain first responder I had all the tell tale signs of shock, which is also when everyone knew something was really wrong with my knee or my leg, we just weren’t sure exactly what, yet. The idea had passed around casually in conversation that there was a chance the hospital may have to cut off my ski boot. I was so mad. There was NO WAY anyone was cutting my Surefoot Custom Ski boot, Oh hell no. They were all so amused, my husband and the barrage of Mountain Ski Safety staff who had amassed as we were waiting to be relocated to another area of the ski resort by vehicle. Even in my moment of agonizing pain, my body slipping into shock from my physical injury, and the dread of contemplating my path to recovery I was mostly mad that 1) my ski season was over, and 2) that they wanted to destroy my ski boot! Once inside the Ski patrol room at Main Lodge I had to sign a release in order for them to remove my ski boot. So I signed the release and off came my ski boot. It took two pairs of hands (not including my own), and was instantly relieved to have it off. They took me in through the ER and put me into a room before even taking my insurance and ID. I was already getting an Xray by the time my husband arrived. The Xray didn’t show much because the swelling was so immense. Off to a CT I go. Yes, a CT scan of my right knee. The doctor came back. A broken tibia. It was obviously apparent. What was not apparent was course of treatment other than no weight bearing at all. My leg was put into a locked brace to prevent any movement of the joint. 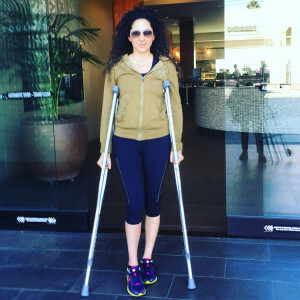 Monday I was able to see an orthopedist in L.A. He took off the brace, no more icing, no more brace, no more pillow. I need to move it about, but no weight bearing. My right tibia plateau is definitely broken, but not displaced. So no surgery. The Dr. also believes my ACL and Medial Meniscus are adequately intact so that will not need surgical repair either- just time. I’m a fainter. 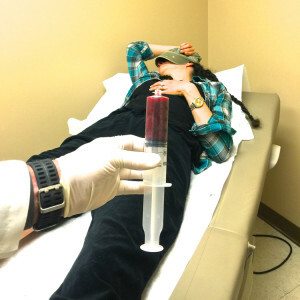 So when the doctor started with the needles and various accouterments I just looked away so I could be tough enough to withstand what he was about to do without throwing up or fainting or both. He removed 40 cc’s of fluid from my knee. My husband took a nice picture though. It was a Kodak Moment. I will be back in his office in two weeks time for another fluid removal session and further course of treatment. After 6 weeks of rest and no weight bearing I can begin with physical therapy. 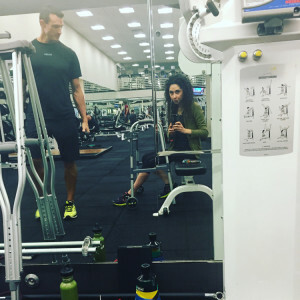 In the mean time I started seeing my trainer Mark DiMuzio twice a week to work on maintaining my upper body and core strength. 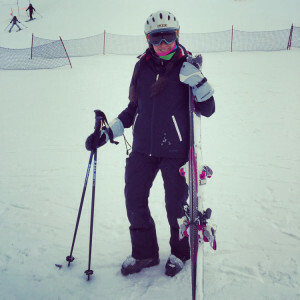 I am mostly mad about missing out on skiing and was worried about making a complete recovery. But all of my doctors and trainer Mark, have assured me I will be back to black (diamonds that is) by next season. Over the last eight years my physical fitness has improved drastically. I have made changes and cut out many items from my diet. These changes came naturally based on the level of my fitness progression. It began with cooking differently, and then adding more exercise. My trainer always said “you are an athlete now.” That athletic and fitness progression was largely fueled by my desire to become a better skier. So I suppose part of being an athlete means engaging in certain activities which open yourself up to the potential of an athlete’s injuries? Work like an athlete, eat like an athlete, play like an athlete, push like an athlete, perform like an athlete, get injured like an athlete, and recover like an athlete. Lindsay Vonn has suffered how many injuries to her knees, undergone surgeries and treatment and still managed to get back on top in her field as a competitive athlete. She’s amazing and keeps winning (and she’s beautiful)!! For the record… I am no Lindsay Vonn, nor am I trying to be. She is a major athletic talent and a force to be reckoned with. Nor was my pain medication so strong that I have become delusional. But, I find her very inspiring. What I do know is that recovery is in my near future. It is going to take time, commitment, and a whole lot of pain to recover my knee strength and range of motion fully after my tibia heals. But I am already back in the gym, and will be back on the slopes as soon as I can which will probably be next season!!! Luckily, I do not need a perfect knee to hit my high notes and sing songs, only one that is good enough to get me around. An extra massive hug to everyone at KDVR Denver and The Everyday Show, and also to Shawn Willson and the rest of the amazing crew at Mammoth Mountain’s Ski Patrol, and Mammoth Hospital Emergency Room staff. In the meantime, expect more songs and more recipes.